Citrix XenApp application virtualization technology enables Microsoft Windows applications to be virtualized, centralized, and delivered to users as a service. It is a prevalent technology for delivering applications due to its ability to vastly reduce administration costs, make more efficient use of IT resources, and improve the performance of enterprise applications over wide area and mobile networks. 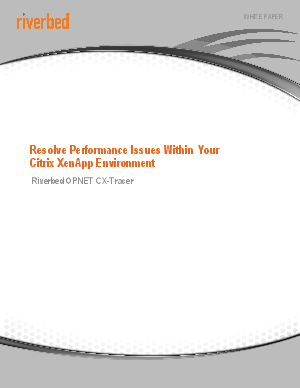 While powerful and beneficial, the Citrix XenApp environment can present new challenges to IT departments when troubleshooting application performance issues. Citrix acts as a proxy for backend applications, making it difficult to get end-toend visibility of transactions and to identify and troubleshoot end-user experience problems. By default, problems are typically blamed on the Citrix tier or ‘the network’.